SiteGround is an independent hosting company with global server solutions. They claim to deliver well-crafted hosting facilities in addition to high-quality services, affordable prices, and a set of features that make this hosting provider worth paying attention. The platform is powering 1,800,000+ domain names across the globe. It boasts data centers in various locations n Asia, Europe, and the United States. It proves that the hosting does everything properly while addressing to a wide range of issues. Launched in 2004, SiteGround featured only a single employee but managed to grow into a popular hosting provider with a bunch of functions. Let’s have a closer look at features it offers to decide if it really deserves opting for. The key to success is to choose a web hosting service depending on your project’s gals. You need to ensure your website’s 100% flawless operation and smooth running. This time we are going to find out whether SiteGround is able to cope with the task. Flexibility – SiteGround comes with an array of solutions that range from shared Linux-based hosting to cloud-based services in addition to WordPress server solutions. If you are planning to build a huge growing online eCommerce platform, the service offers Reseller server option as well. Additional capabilities make it possible to boost performance and security thanks to CloudFare integration. Good Uptime – SiteGround never uses ready-made hosting solutions. The service totally relies on its self-crafted in-house solutions to deliver high-quality hosting experience to its customers. The average uptime is 99.99%, which is even 0.05% higher if compared with the hosting industry standards. Rich Feature Set – the web hosting service comes with a bunch of features in addition to integration capabilities. From unlimited email accounts and database to FREE SSL certification and website transfer. The platform delivers multiple server solutions. Extended Customer Support – it seems like SiteGround is truly focused on its customers. The support is available via several channels including 24/7 support by phone, a live chat option or ticket-based system. Moreover, users might find tons of useful information in a service’s knowledge articles, tutorials, etc. Looks like a perfect web hosting provider. Is it really so good? Let’s have a closer look at some of the possible downsides. Limited Plans – The first challenge may erupt once you have examined the available plans. They look a bit limited, as SiteGround does not offer much storage. For example, a starting plan features only 10GB of storage space. In other words, it is hardly the best idea if you are planning to have more than 10,000 visitors on your website monthly. No Free Trial – Unlike any other hosting providers, SiteGround does not offer a free trial. but it has a 30-day money back guarantee. No Windows Server Solutions – SiteGround represents a platform built on Linux containers. For this reason, you should not count on Windows server options. We are not going to rush and decide if SiteGround is worth paying attention or not. It certainly has some great features though downsides can also be crucial for some websites. It is high time we dived deeper to examine the platform’s capabilities more thoroughly. Free Website Transfer in 24 Hours – SiteGround will transport your account from the previous hosting service to its own within 24 hours. Free Website Builder – the platform has its own website builder, which makes it an all-in-one solution for users who are eager to have everything in one place. CDN Integration – some users will definitely appreciate integration with CloudFare’s CDN. Moreover, you will be provided with a free PCI compliance. 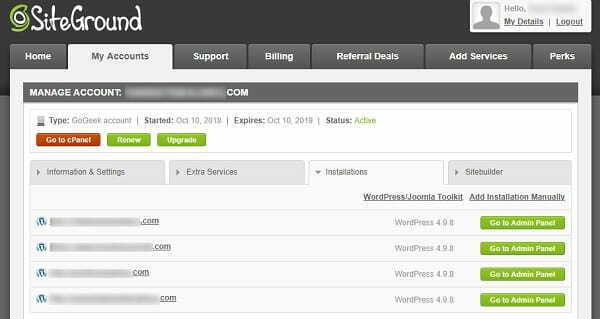 Managed WordPress Hosting – The platform will take care of all your WordPress plugins and updates in terms of website speed, performance, security, etc. SiteGround boasts an array of in-house crafted caching instruments like SuperCacher. It is responsible for webpage loading speed. Simple eCommerce Installs – Thanks to SiteGround, you do not have to install multiple eCommerce apps to power the website. The platform offers 18 basic applications. All you need is to choose one that meets your needs and install it with just a click. Free Security Add-ons – apart from basic security means, SiteGround offers some extended features to keep the website away from danger. Those means include IP address blocklists, hotlink protection, SpamAssassin and SpamExperts, etc. Most users will also appreciate the fact that SiteGround is focused on such popular CMS systems as WordPress and Joomla. The web hosting services look pretty well when it comes to website’s speed. The SDD platform boasts fast server performance ensuring quick TTFB. The company has data centers located in different parts of the world. You should never underestimate this particular fact, as the speed can be lower if your website files have to travel a longer physical distance. SiteGround is good for projects aimed at different target audience from different countries. We should also mention the platform’s generous allocations performed by the latest web technologies and software. 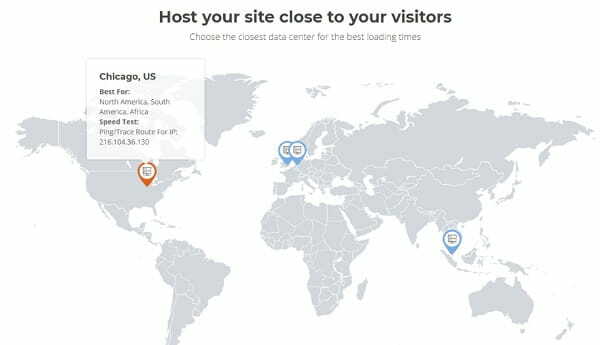 It all results in 714ms of page load time, which is faster if compared to the average rate of 890ms performed by the majority of hosting providers.